Rhinoplasty Changing the size and shape of the nose. The nose is the most defining characteristic of the face and nothing has a greater impact on how a person looks than the size and shape of their nose. As a result every year millions of people seek to change the appearance of their nose. Some people are unhappy with the nose they were born with, and some with the way their nose has changed due to aging. The goal is to improve the nose, making it harmonize better with other facial features. In most cases, the incision for rhinoplasty is placed inside the nose with no visible scarring. 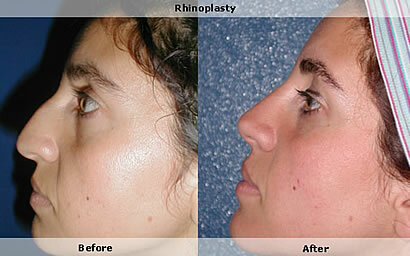 Rhinoplasty is an ambulatory (local anesthesia) operation taking 2 to 3 hours. For 5 to 8 days a small splint will be placed on your nose to protect it. You may experience bruising and minor swelling in the eye area. Dressing and splints are usually removed six or seven days after surgery. 1. What is a Rhinoplasty? 2. What is the difference between Rhinoplasty and Rhinoseptoplasty? 3. What is a Nosejob? 4. Who can get Rhinoplasty? 5. Am I a good candidate for Rhinoplasty? 6. What are the possible risks of a Rhinoplasty procedure? 7. How long does a rhinoplasty procedure last? 8. What type of anesthesia is Rhinoplasty performed with? 9. Will I have scars from a Rhinoplasty? 10. Is rhinoplasty an inpatient or outpatient procedure? 11. When will the cast be taken off and does this hurt? 12. How much downtime is associated with a Rhinoplasty? 13. Can a Rhinoplasty procedure be financed? 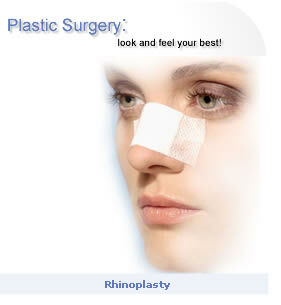 Rhinoplasty/Rhinoseptoplasty is a plastic surgery procedure to reshape the nose. Commonly referred to as a nose job, rhinoplasty can correct several cosemetic issues This surgery can have a subtle or dramatic effect on your face. 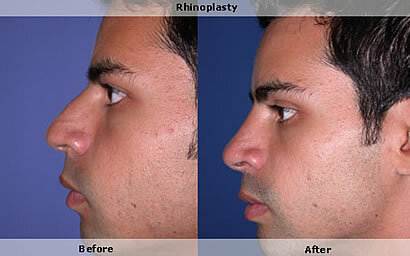 Rhinoseptoplasty is a surgery to help clear airway issues and is often combined with Rhinoplasty. 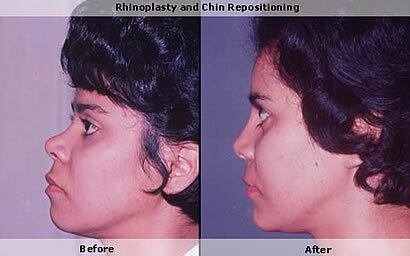 Rhinoplasty is a plastic surgery procedure dealling with cosemetic issues only where Rhinoseptoplasty deals only with airway issues. 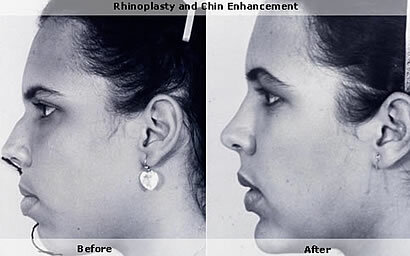 Rhinoplasty can be performed on anyone, in good health. It is recommended that people do not have a rhinoplasty / nosejob procedure until they have fully grown because they nose shape can continue to grow.. A qualified rhinoplasty surgeon will thoroughly evaluate the rhinoplasty candidate to make sure they are a suitable candidate. The facelift will correct the lower portion of the face, cheeks, jowls, and the entire neck. It will not improve the upper portion of the face, the position of the eyebrows, the wrinkles between the eyebrows and the excess skin of the upper and lower eyelids or the lower eyelid bags. It will do a little for the smile lines and the wrinkles around the mouth. Rhinoplasty is a permanent cosmetic procedure other than the changes that come with your natural aging How long is the surgical time for rhinoplasty? Rhinoplasty typically takes between two and three hours to perform. Rhinoplasty is normally performed with a combination of local anesthesia and sedation or with general anesthesia. Incisions are most often made inside the nose during a rhinoplasty procedure, so you should have no visable scars. which allows for no scarring. In certain instances, including when a patient wishes to narrow their nostrils, the surgeon will make incisions at the base of the nose. A surgeon that is skilled at performing rhinoplasty procedures will be able to make incisions that are more easily concealed and will fade over time to become barely noticeable. Rhinoplasty is normally performed as an outpatient procedure and does not require an overnight stay. The cast is removed approximately 7 days post-operatively. You will feel a slight stiffness in the upper lift as the swelling "moves downward". This will subside in a matter of hours. you must be very careful not to bump it as it is vulnerable to breakage. If you had a rhinoplasty where the nostrils were narrowed you will have your sutures removed. This may sting a bit, especially since it is in a sensitive area. although most people still feel numb in the tip area and report only minor discomfort. Following a rhinoplasty procedure You should expect swelling and bruising that could take about three weeks to subside. The swelling and bruising will be the worst right after your surgery for a couple days. Approximately 80% of the swelling and 100% of the discoloration are usually gone by 2-3 weeks after surgery. 90% of the swelling is gone by three months after surgery and the rest slowly disappears over the next year All normal activities will be able to be resumed within one month. Financing is available for many plastic surgery procedures. Click here for more financing information.